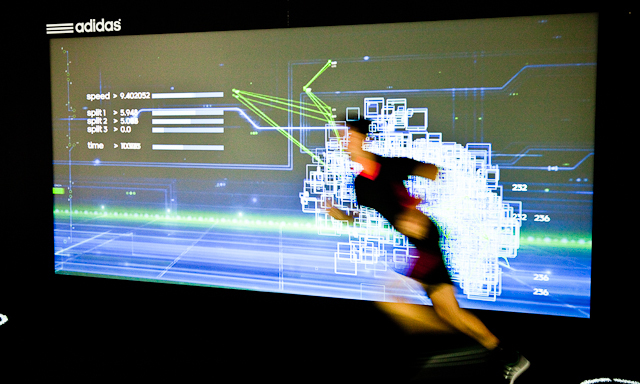 In early April, I managed a team at Kin Design, who had been engaged by M&C Saatchi to create a large digital interactive installation for Adidas. Over the following 7 weeks, my team created bespoke content for the inaugural Adidas Lab event in London. Within two months, we created viable concepts, designed and animated them, built the system to house the event both physically and programmatically and tested it for the live date of May 24th. The pressure was on as the Adidas CEO (Herbert Hainer) and CMO (Hermann Deininger) were using the event to officially launch some key technical developments that Adidas have been working on over the last year or two. The press conference hosted by Herbert Hainer also had two famous footballers in the guise of Zinedine Zidane & Michael Ballack to support the Adidas Lab event. Both players tried out installations that my team had worked on. This was an interactive 20m track that users ran up and down three times, to identify which Adidas boot was most appropriate for them. Each of the three stages related to a different skill; speed, agility and control. We also integrated a real time video capture and render system into the track that used the RFID tag in data to upload the user’s video to the Adidas YouTube channel and post an update on their preferred social media channel of this video and their result (overall score and boot preference). See an example of one of the thousand plus user videos below. 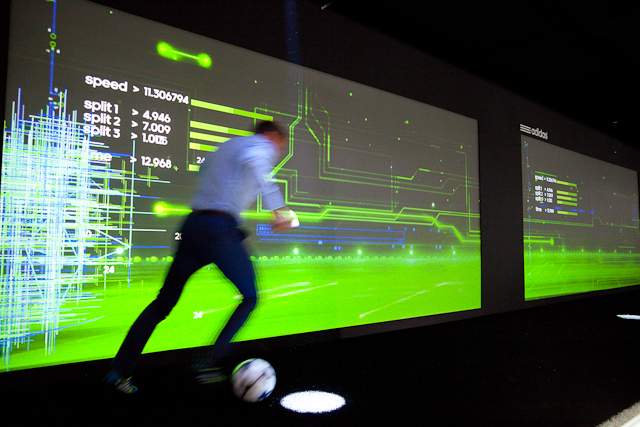 We created an interactive picture based installation that users could look through as they watched a video that outlined the latest Adidas tech in MiCoach, where player movements were tracked on an iPad through a chip in the player’s kit. 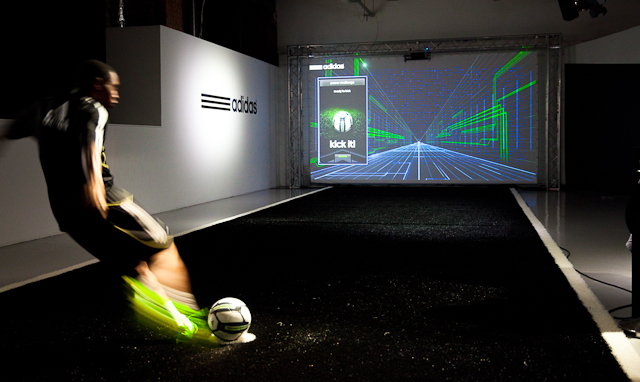 Adidas created a ball that could transmit speed, bend and flight trajectory to an iPhone App. My team created a large screen for users to kick the ball against. At the top of the screen we installed a scanning laser to define where the ball hit the screen and trigger an animation. The App data was passed through AirPlay and shown on the screen to allow views to see the data on the iPhone screen. Overall, the event was a great success and we are looking into opportunities to create future Adidas Lab events. this this website conations truly fastidious funny data too. Hi, I do believe this is a great website. I stumbledupon it 😉 I’m going to revisit yet again since i have book-marked it. Money and freedom is the best way to change, may you be rich and continue to guide other people. Hello There. I discovered your blog the use of msn. This is a very smartly written article. I will make sure to bookmark it and return to read more of your useful info. Thank you for the post. I will certainly comeback. Thanks for your comment. Glad to know you like the blog. I seriously love your site. Great colours & theme. Did you create this website yourself? Please reply back as I’m planning to create my own site and would love to find out where you got this from or just what the theme is called. Many thanks! THanks for you comment. You have asked a popular question. I use a WordPress theme called iTheme2. Hi, Neat post. There’s a problem together with your site in internet explorer, might test this? IE nonetheless is the marketplace leader and a huge component to other people will leave out your wonderful writing because of this problem. Thanks for the heads up. I will run some test. someday. I want to encourage continue your great job, have a nice holiday weekend! It’s really a great and useful piece of information. I am satisfied that you simply shared this helpful information with us. Please keep us informed like this. Thank you for sharing. My blog has a lot of unique content I’ve either written myself or outsourced but it looks like a lot of it is popping it up all over the internet without my authorization. Do you know any ways to help protect against content from being stolen? I’d really appreciate it. This is a tough one and there is no simple answer unfortunately. I am a professional photographer and need to show examples of my work on my website and blog. However, my work gets copied and used else where all the time. Aside from the copyright infringement, there is a real world cost associated with travelling to a destination, taking the shot, then post production and hosting fees. So, what might seem harmless to someone who uses one of my images is actually systematically undermining my ability to take further shots as I am not paid for hard costs already incurred. Wow, superb blog structure! How long have you been running a blog for? you make running a blog glance easy. The entire look of your site is excellent, as well as the content! Many thanks. I have been working with blogs since 2006 but only really been blogging properly since I start my own blog up in the summer of 2008, when I used it to journal my cycle tour preparations and tour from Lands End in England to John O’Groats in Scotland. When someone writes an post he/she keeps the idea of a user in his/her brain that how a user can know it. So that’s why this piece of writing is perfect. Thanks! My last blog (wordpress) was hacked and I ended up losing months of hard work due to no back up. Do you have any solutions to protect against hackers? This is a topic question I have been asked a few times recently. I think people who install blogs on their own servers tend to be hacked more frequently than those blogs hosted on the WordPress platform. My family keeps telling me that I am wasting my time here on the web but I know I am getting know-how every day by reading this fastidious articles or reviews. ideal means of writing? I’ve a presentation next week, and I am on the look for such info. THanks for your comment. If you are interested in other similar styles of posts, I suggest you do a search for blogs written by agency creatives or producers specialising in the area that you are interested in. Cheers. I have been surfing on-line more than 3 hours nowadays, yet I by no means found any interesting article like yours. It’s a beautiful piece. In my opinion, if all web owners and bloggers made just right content material as you did, the web can be a lot more helpful than ever before. Appreciation to my father who shared with me on the topic of this webpage, this web site is genuinely remarkable. Wow, fantastic blog structure! How long have you been blogging for? You make running a blog look easy. A full look over your web site design and it is wonderful, as well as the content! I have had a few friends who have had their WordPress blogs hacked. However, these are all people who have downloaded and installed the WordPress blog structure on their own servers. This is in fact a WordPress blog, hosted on WordPress servers. I have not used other blogging packages but I understand that Google’s Blogger is pretty decent. folks are speaking intelligently about. Now i’m very happy I found this in my search for something concerning this. Terrific work! This is the kind of info that is supposed to be shared across the web. Shame on Google for not positioning this article higher! reading it, you are a great author. I will be sure to bookmark your blog and may come back in the future. I would have loved an activity like this when I was a child. I’ve become infatuated with detecting frugal and hip sites that offer easy access to download psp games online and navigate easily for the average consumer. Note the name of the web site so that you can inspect the site again the next time. I almost never leave remarks, however after reading through a few of the remarks here Adidas Lab London experiential event | All Terrain Photography Blog. I actually do have some questions for you if it’s okay. Is it only me or do some of the remarks look like they are left by brain dead visitors? 😛 And, if you are writing at additional online social sites, I’d like to follow you. Could you post a list of the complete urls of all your public pages like your linkedin profile, Facebook page or twitter feed? If you are interested in other things I post online, check out my About Me page as I have links to my other websites and social sites, such as LinkedIn. Nothing on Facebook etc. as I spend so much time producing work that I only really have enough time to update this blog in between jobs. Cheers. Wonderful site. Lots of helpful information here. I’m sending it to some buddies ans also sharing in delicious. And obviously, thanks on your effort! I really love your website. Pleasant colours & theme. Did you make this amazing site yourself? Please reply back as I’m planning to create my very own site and would love to find out where you got this from or exactly what the theme is named. Thanks! Fantastic goods from you, man. I’ve understand your previous stuff too and you are just extremely fantastic. I really like what you’ve done here, really like what you are stating and the way in which you say it. You make it enjoyable and you still care for to keep it sensible. I can’t wait to read far more from you. This is really a tremendous site. Hi to everyone It’s actually a pleasure for me to see this website, as it consists of much precious information. What’s happening? I am new to this and stumbled upon your blog. It absolutely helpful and it has helped me out loads. I’m hoping to contribute & aid other users like its aided me. Great job. this site and now this time I am visiting this site and reading very informative posts at this place. as yours and my users would really benefit from some of the information you provide here. Please let me know if this okay with you. Many thanks! Sure, no problem as long as you use trackbacks / credits. Cheers. Hi! I really like your writing very a lot! I propose we keep in touch extra about your post on AOL? I require an expert in this area to resolve my problem. May be that is you! Looking forward to more. You can subscribe to my blog if you want to stay abreast of new updates. You can contact me directly through the details posted on my About Me page. Cheers. trying to find a theme or plugin that might be able to resolve this issue. If you have any suggestions, please share. Two options are either design your site to be mobile focused initially and then scale up to desktop (something I have done at various digital agencies, to ensure that mobiles are accommodated for and that the desktop still looks stella). I would recommend against a devise specific approach as this is laborious and complicated unless you only plan to utilise say the iOS system. Alternately, use a standard WordPress template as these should be mobile optimised. Hi, for all time I used to check website posts here in the early hours in the daylight, because I like to find out more and more. Hi there, yes this article is really pleasant and I have learned lot of things from it on the topic of blogging. Could be time of day, such as when North America come online, etc. If not, it is likely to be connected to all the various social media sites where I pull my content from. Howdy, I read your blog from time to time and I own a similar one and i was just curious if you get a lot of spam comments? If so how do you stop it, any plugin or anything you can recommend? Hi my friend! I want to say that this post is awesome, niceLY written and include almost all vital info. Pretty component content. I just stumbled upon your blog and wanted to assert that I get actually loved account your weblog posts. Anyway I’ll be subscribing to your posts from now on. Nice post. I used to be checking constantly this web blog and I’m impressed! Extremely helpful information particularly the remaining phase 🙂 I deal with such information much. I was looking for this certain information for a long time. Thanks and good luck. to manually code with HTML. I’m starting a blog soon but have no coding knowledge so I wanted to get advice from someone with experience. Any help would be enormously appreciated! This is simply one of the standard WordPress blogs that I have adapted and personalised. Dead easy really. Hi there, everything is going perfectly here and of course every one is sharing information, that’s actually good, keep up writing. Hi there, I discovered your site by the use of Google and found that it’s really informative. I have bookmarked it in my Google bookmarks. Please continue these articles in future. Numerous people might be benefited from your writing. Hello! Someone in my Myspace group shared this site with us so I came to give it a look. I’m definitely loving the information. I’m book-marking and will be tweeting this to my followers! Superb blog and excellent design. Good article! I will be linking to this great content on my site. Keep up the good writing. I’m impressed, I have to admit. Seldom do I come across a blog that’s both equally educative and interesting. I’m very happy that I found this article.